I had no clue where to find Matthew when my aunt asked me to set her handheld, electronic Bible to the first chapter of that book before leaving after our visit today. “It’s the first book of the New Testament” she said as a means to help, but not realizing how little that meant to me. I don’t feel bad about not knowing how many clicks forward from Deuteronomy or back from Acts I would need in order to get her all queued up for tomorrow’s lesson. After all, the Bible really isn’t my thing. And, although technology is my thing, her little gadget was just a simple black box with a couple of buttons, lacking amenities like a screen that could have displayed a table of contents and made the task much simpler for a King James novice like me. I managed to figure out the proper combination of key strokes to move between books rather than chapters within books and got on a roll. The deep, calming voice of the iBible began solemnly rattling off “Judges. Ruth. 1 Samuel…..Ezra. Nehemiah” and intermittently having its impecable pronunciation cut short by my frantic pressing of the downward facing arrow. “Am I going in the right direction?” Before she could answer, the speaker uttered “Job” and she told me to go ahead and stop there. I don’t know if she was just trying to give me a break or if something about the spoken-word trip through the old testament triggered a need to focus on that particular book. I’ve decided that I’ll ask her about it when I see her again next week. Over the past couple of months I have been visiting my aunt in her adult foster home. I spent a good deal of time with her as a child, but we haven’t been a part of each other’s lives since. I can probably count on one hand the number of times we’ve seen each other outside of funerals over the past 30 years, so finding talking points can often be difficult. There is only so much reminiscing that can be done to fill the time. Upon arriving for our visit today, I started with the usual inquiries like “How are you feeling?” “What’s going on in the world that I should know about?” “Did you eat lunch yet?” She answered all of the questions, some with more gusto than others, but today would end up being about more than small talk. I recently learned that she loved to write and that she even saw a few of her stories and poems published during the 1970s. I had those writings with me today. Since she is no longer able to see small print, I asked if she would like me to read them to her. “Yes, that would be nice” she said, still stunned that her sister-in-law had held onto the original publications all these years and then passed them along to me. Seeing her smile as she listened to the words she’d penned so long ago, discussing what had inspired them, and then sharing some of my own work with her made for a very special day. So, what does my fumbling around in the Bible at the end of our visit have to do with this story? Whether she was writing a poem celebrating the second coming or a short story that illustrated the kindness of strangers when her family was new to town and her father fell ill, my aunt’s work was inspired by her Christian faith, something that is almost totally foreign to me. I realized today that we have a real connection through writing and I’d like to foster that in any way I can. Who knows? If I study her book maybe we’ll have more to talk about or even write a story together. At the very least, I’ll be able to find the book of Matthew the next time she asks. This story is in response to the Sunday Photo Fiction challenge. Writers submit a 200 word story inspired by the photo prompt provided each Sunday. Click the blue frog at the bottom of the post to view all stories for this week and submit your own. 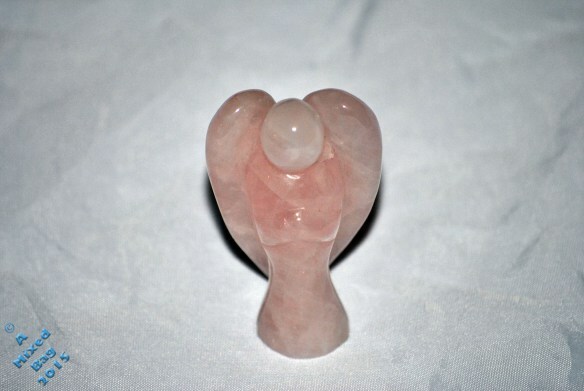 “You know that’s rose quartz AND an angel don’t you?”. With one eyebrow hiked up nearly into her hairline and her mouth scrunched in a smirky slant on the side of her face, it felt more like a test than a simple request for confirmation. When I didn’t immediately respond, she followed up with “Well, you better be careful. If you get that too close to your cold, dark, atheist heart, it may explode into a million tiny shards and blind us both!”. We laughed, probably too hard, but her question and concern were well-founded. What was a lifelong unbeliever doing clutching that tiny idol? How had that “hippie dippy” store, wedged between the coffee shop and self-serve dog grooming facility, finally lured me in to peruse it’s mystic wares? I had been able to successfully navigate past it for years, unaffected by the wafting tendrils of frankincense, sage, and patchouli that, at times, could tickle the senses from more than a block away. I don’t even know what it means to smudge, this place had nothing to offer me! Why had today been different then? How did I end up with her cool, smooth wings resting in my palm?